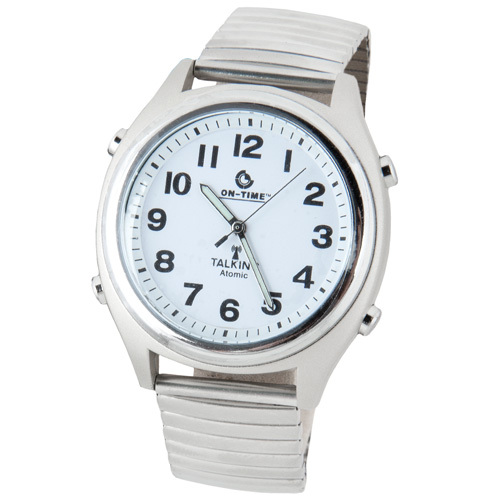 Huge closeout buy on the watch that announces the world's most accurate time by voice! The atomic watch that tells it like it is! This On-Time watch accepts signals from the U.S. atomic clock in Fort Collins, Colorado and automatically resets itself for accuracy of one-millionth of a second. A pleasant easy-to-understand male voice announces the time on an hourly basis. Plus, you can hear the time, day of the week, month, date and year anytime with a simple press of a button. Perfect for night time driving, for those with poor eyesight and more. Also has white face and customizable alarm announcements. Metal band. Not available in AK, HI or P.R.